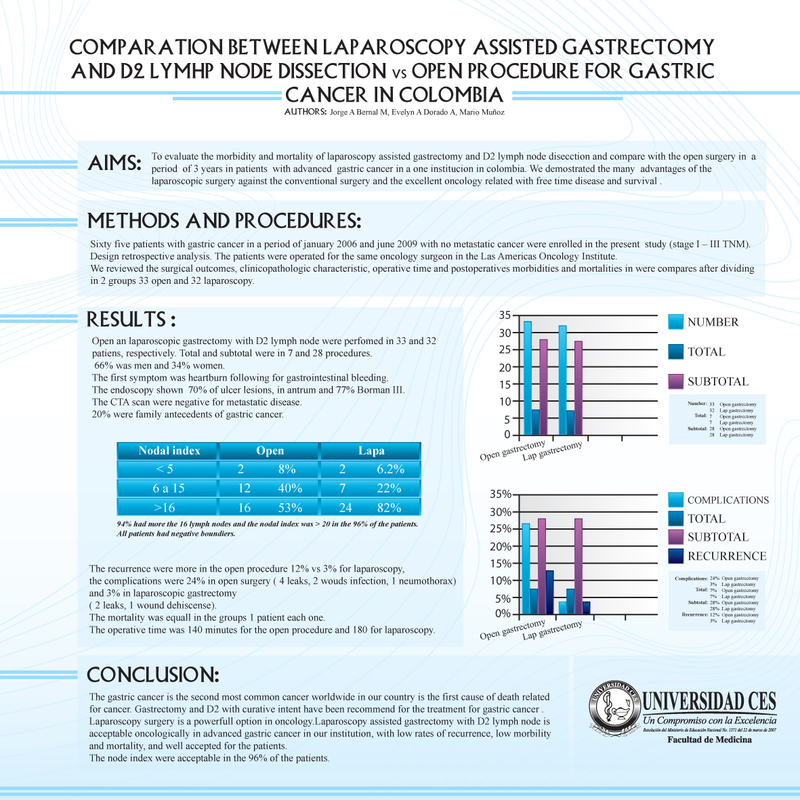 INTRODUCTION: To evaluate the morbidity and mortality of laparoscopy assisted gastrectomy and D2 lymph node disecction and compare with the open surgery in a period of 3 years in patients with advanced gastric cancer in a one institucion in colombia. The gastric cancer is the second most common cancer worldwide in our country is the first cause of death related for cancer. We dont have screening programs and the advanced state is theprincipal diagnosis for our patients. surgical resection is the only treatment that may offer a cure for this patients. Gastrectomy and D2 with curative intent have been recommend for the treatment for gastric cancer . Laparoscopy surgery is a powerfull option in oncology. We want to demostrate the many advantages of the laparoscopic surgery over the conventional surgery and the excellent oncology results for the treatment and survival . METHODS AND PROCEDURES: sixty five patients with gastric cancer in a period of january 2006 and june 2009 with no metastatic cancer were enrolled in the present study. Design retrospective analysis. The patients were operated for the same oncology surgeon in the Las Americas Oncology Institute. We reviewed the surgical outcomes, clinicopathologic characteristic, operative time and postoperatives morbidities and mortalities in were compares after dividing in 2 groups 33 open and 32 laparoscopy. RESULTS: Open an laparoscopic gastrectomy with D2 lymph node were perfomed in 33 and 32 patiens, respectively. Total and subtotal were in 7 and 28 procedures. 66% was men and 34% women. The first symptom was heartburn following for gastrointestinal bleeding. The endoscopy shown 70% of ulcer lesions, in antrum and 77% Borman III. The CTA scan were negative for metastatic disease. 20% were family antecedents of gastric cancer. 94% had more the 16 lymph nodes and the nodal index was > 20 in the 96%. The recurrence were more in the open procedure 12% vs 3%, the complications were 24% in open surgery ( 4 leaks, 2 wouds infection, 1 neumothorax) and 3% in laparoscopic gastrectomy ( 2 leaks, 1 wound dehiscense). The mortality was equall in the groups 1 patient each one. The operative time was 140 minutes. CONCLUSION: Laparoscopy assisted gastrectomy with D2 lymph node is acceptable oncologically in advanced gastric cancer in our institution, with low rates of recurrence, low morbility and mortality, and well accepted for the patients. The node index were acceptable in the 96% of the patients.